This page comes to you from the remarkable Quinta Lala camp site near the Sacsayhuaman archaeological site just outside Cusco. We had heard good reports of Quinta Lala from several people we met en-route to Cusco. We had a street map of Cusco, we had directions and we even had a GPS location (S 13.505862 W 71.984937) and K-Nine was leading, what could go wrong? Corpus Christi! (Feast of (Latin: body of Christ) A Christian feast honouring the institution of the Eucharist, observed in the West on the second Thursday after Whit Sunday. It is not generally observed by Protestant Churches). Try as we might every time we attempted to cross the centre of Cusco to get to Quinta Lala we were stopped at a "road closed" barrier. The entire city centre was closed in preparation for the Corpus Christi processions the following day. We could get within 800 metres of Quinta Lala , we could even see it, but we could not get our vans there. Eventually we found a taxi driver who agreed to lead us the 15km around Cusco that would allow us to approach Quinta Lala from the East. Quinta Lala is a very rare thing in Central and South America: a real camp site with water, electricity (220 volts!) hot showers, security, grass, a laundry and even wireless Internet (hence all the photos, maps and GPS tracks)! 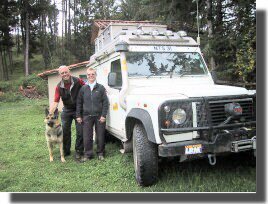 But even more important, it is run for overlanders by an enthusiast: Helmie Paulissen (originally from Holland). Check out their web site to see who is staying there now! 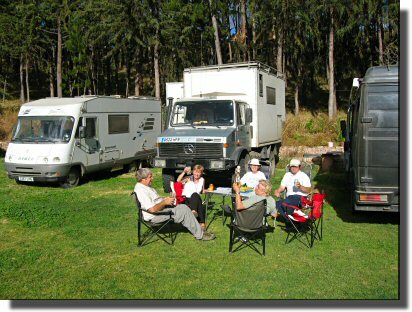 Quinta Lala charges about $2.50USA per person and $3.00USA per vehicle per night. They sell wine, beer and mineral water. Helmie also provides a very useful list of recommended restaurants, cheese shops, coffee shops, gay and lesbian establishments and garages (e.g. 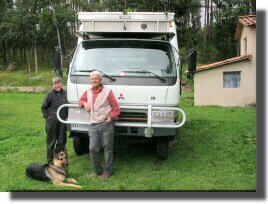 Cusco Overland Service, Av. Venezuela H-10, Parque Industrial, Wanchaq, Phone: 234444. Ask for Efrin Canari Quico. They repair all the overland trucks.) etc. You can walk into town from Quinta Lala in about 25 minutes (downhill using the steps) and a taxi back from the centre should cost 4 or 5 Soles. Quinta Lala makes an excellent base to explore the Inca Sacred Valley and of course Machu Picchu. Highly recommended. How to find Quinta Lala. Instructions: From the Plaza de Armas (the main square in Cusco) enter Plateros and its continuation Saphi . At the end of the wide road turn sharp right at the first hairpin (Billboard: El Cusco es Primero ), and follow the steep ascending road. Leave the church at your left; go through the second hairpin and zigzag another kilometer until you see on a curve a wooden sign at your left hand which says: Hacienda Llaullypata, Reserva Ecoturistica Privada . Enter this little cobbled road. The second house on the right is Quinta Lala , your home in Cusco! The reason for the very detailed instructions is that there are many narrow streets in Cusco, a complex one way system and some streets turn into steps! If you get really stuck (as we did) follow a taxi. If the taxi does not know Quinta Lala ask for the Hotel Inca Tambo next door. The cost should be about 5 to 10 Soles. Or for the brave follow one of our GPS Tracks. 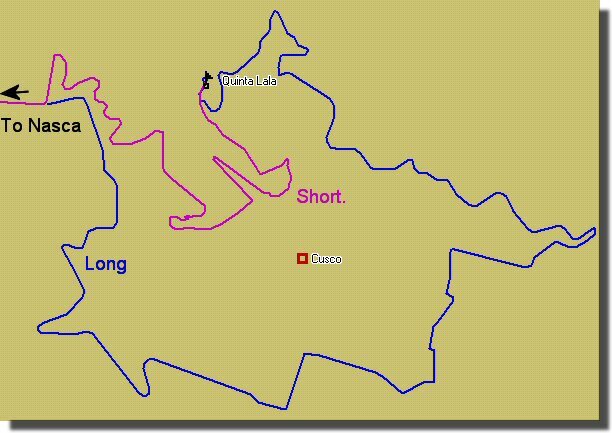 If you would like to follow a GPS track to Quinta Lala from the Nasca-Cusco road you can download a Zip file containing both a short (7km) and long (15km) track (as above). 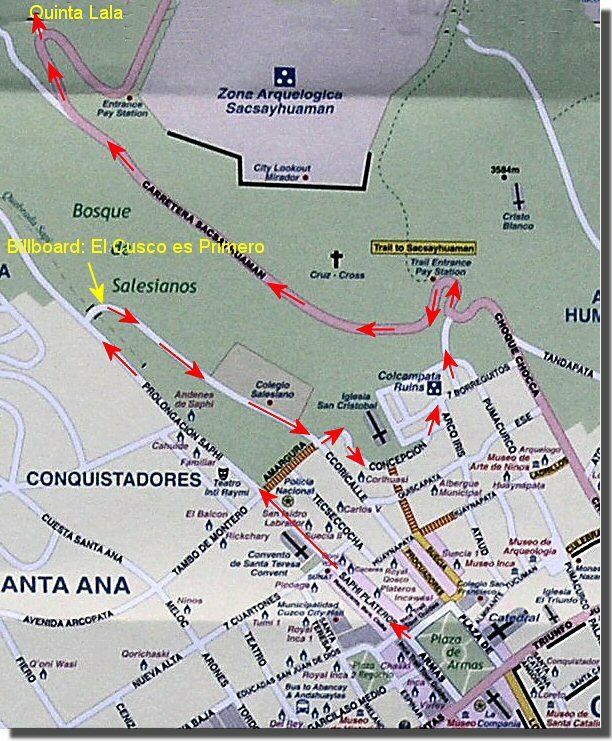 The Long track may be useful during festivals (when the area around Plaza de Armas may be closed) or for those arriving from the South. The turn off from the main road from Nasca for the start of the short track is at S 13.507497 W 71.996799, just passed the large green "Cusco" town sign. 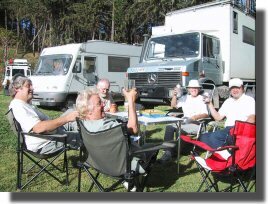 Happy Silkroute Club Members at Quinta Lala. 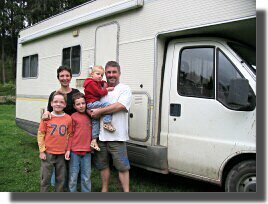 2006-04-16: Carl and Mary Hunter, from British Columbia. 2006-04-16: Norman and Barbara Seddon from Birmingham, England. 2006-06-14: PanAm 2006. Mick, Mo, Stephen, Ann and Clive.